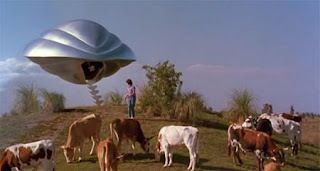 Aliens were big in the 80's - and if you're looking to settle down with the family and a tub of popcorn (or alone with a reefer and a mega-gulp for that matter), you'll find no shortage of wholesome UFO-featuring movies to keep you entertained from that particular period in time. Flight of the Navigator, the story of 8-year old David's adventure with a wise-cracking alien-ship, was a firm favourite back in the day. Batteries Not Included - that tells the tale of the tenants of a Manhattan apartment block who befriend a family of miniature saucer-shaped mechanical beings, is another great movie of a similar ilk. And of course, E.T. the Extra Terrestrial - featuring he whom is arguably the most beloved alien to ever have graced the silver-screen, and his forever immortalised glowing-finger - in a movie that no life should be lived without seeing at least once. 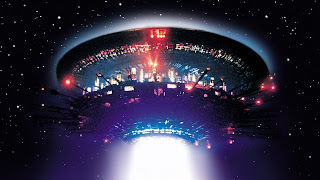 The second oldest entry to our list comes in the form of 1977's Close Encounters of the Third Kind, a movie that follows a group of individuals efforts to make contact with alien-intelligence, and that also features what is possibly the most renowned example of aliens exhibiting their own musical talents (in a way). While the oldest, and contender for personal favourite here at HPM, comes in the form of the 1953 version of War of the Worlds - which whether in book, radio, or movie format - remains arguably the best story of human/alien interaction (conflict) ever penned. In terms of scale, and appreciation of special-effects-infused alien invasions on a planetary-level, there are certain movies that cannot go unacknowledged. Primarily, Independence Day, the 1996 movie that enthralled viewers with an all-out ET invasion of the likes that had never previously been witnessed - with city-sized alien spaceships so vast, that they could literally block out the sun. But also both Skyline, another alien-invasion movie of epic-proportions, and Prometheus, the 2012 addition to the Alien-franchise, that explores the origins of man-kinds creation, are deserving of honourable mentions. 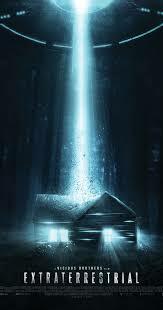 2014's Extraterrestrial might follow a fairly well-trodden formulaic path for a part, being reminiscent of every "a group of teenagers lost in the woods" type horror ever produced. But beyond that it's a surprisingly well-made and stylish movie that takes the ET element and makes it its own, and is far more entertaining than expected - making it well worth a gander. Shaky "found-footage" camcorder-type movies aren't everybody's cup-of-tea - but if like us here at HPM you're a fan - the following are a few movies that you might enjoy watching also, if you haven't already. The McPherson Tape (also known as Alien Abduction: Incident in Lake County) was a 1989 TV movie, and while it's about as low-budget as it comes, it does a pretty good job of capturing the kind of tensions a family finding themselves in the midst of an unexpected alien-intrusion; might endure - and in it's own way is another classic of the genre. While Hangar 10 makes for another interesting UFO-laden addition to our list from the mockumentary-school of film-making - and reminds us that some fences are in place for a reason. Circle offers a particularly unique take on the alien-invasion concept, forcing human-abductees to face-off against each other in an unusual manner in a battle for survival. While our final offering, The Signal, makes for possibly the most bizarre, and existential movie on our list - within which three MIT graduates find themselves on the flip-side of a very different curtain.